The Humanoid Landscape – Whitstable and the gog/magog labyrinth | Unofficial Britain. The oddest entry I’ve come across in the nebulous genre of landscape writing/psychogeography/white blokes walking around taking notes, has to be The Humanoid Landscape by astrologer, ex-environmental campaigner and Whitstable native Fen Lander. Fen Lander has uncovered something strange – weird even – within the landscape of the Isles Of The Gods, that is, the British Isles . 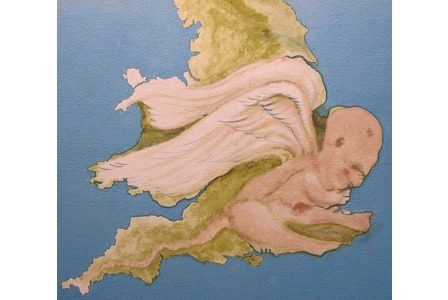 . .
A massive winged, horned, be-tailed cherub, angel, humanoid, that no one sees or has seen for two thousand years. According to the author, the name of every settlement, hamlet, village, town and city in England and Wales can be – is meant to be – read like a physiological diagram. I don’t really understand what this book is about, but it made me very happy to discover such eccentricity in the town I grew up in, and that Whitstable could provide the key for someone to decipher the gog/magog labyrinth that had obviously been bugging them. Gary Budden is co-founder of independent publisher Influx Press and assistant fiction editor at Ambit magazine. He lives in London. You can read more by Gary on his blog, New Lexicons.